Pусско-немецкий разговорник содержит минимум слов и фраз,необходимых российским гражданам, выезжающим в Германию. Цельразговорника - помочь тем, кто не владеет немецким языком, вделовой или туристической поездке заграницу. В разговорник включенынаиболее употребительные слова и выражения. Они сгруппированы потематическим разделам: "Приветствие и встреча","Знакомствa","Награнице" и т.д. Содержание: * Приветствие и встреча. * Знакомствa *О себе * На границе. * В городе. * Числа. * Дни недели и время. * Вотеле. * Путешествие. * Развлечения, отдых. * В ресторане. * Впути. * Покупки. * Такси. * Извинения и благодарность. * Месяцы ивремена года. * У врача, аптека. * Повседневные слова и фразы. *Прилагательные * Цвета * Тело * Профессии * Телефонный разговор *Банк * Свидание * Цвета Разговорник включает 2 теста позволяющихлучше усваивать материал. Бесплатный русско-немецкий разговорникпредназначен для тех, кто не очень хорошо владеет немецким языком,он упростит общение и взаимопонимание. Разговорник работает врежиме ОФФЛАЙН и не требует интернет-соединения для работы.Если высобираетесь в путешествие по Европе или у вас намечаетсякомандировка в немецкий город, то наш русско-немецкий разговорникименно то, что вам нужно. Фразы, разделенные по темам, помогутбыстро сориентироваться в ситуациях и помочь в разговорах.Транспорт, покупки, финансы, путешествия, знакомства, ресторан,отель - везде вы сможете общаться, даже с самым низким знаниемязыка. Язык немцев, австрийцев, лихтенштейнцев и большей частишвейцарцев, официальный язык Германии, Австрии, Лихтенштейна, одиниз официальных языков Швейцарии, Люксембурга и Бельгии. Являетсяодним из самых распространённых языков в мире после китайского,арабского, хинди, английского, испанского, бенгальского,португальского, русского и японского. Немецкий — один изофициальных и рабочих языков Европейского союза и ряда другихмеждународных организаций. Немецкий разговорник это лёгкий ивесёлый новый способ выучить Немецкий язык. English-Germanphrasebook contains a minimum of words and phrases necessary toRussian citizens traveling to Germany. The purpose of a phrase book- to help those who do not speak the German language, for businessor leisure trips abroad. The phrase book includes the most commonlyused words and phrases. They are grouped by thematic sections:"Welcome and meeting", "Znakomstva", "On the border", etc. Content:* Welcome and meeting. * Znakomstva * About myself * On the border. * In the city. * Numbers. * Days of week and time. * In a hotel. *Journey. * Entertainment, recreation. * Restaurant. * On my way. *Purchases. * Taxi. * Apologies and thanks. * Months and seasons. *The doctor, pharmacy. * Everyday words and phrases. * Adjectives *Colors * body * Professions * Phone conversation * Bank *Appointment * Colors The phrasebook includes 2 test allows toabsorb the material better. 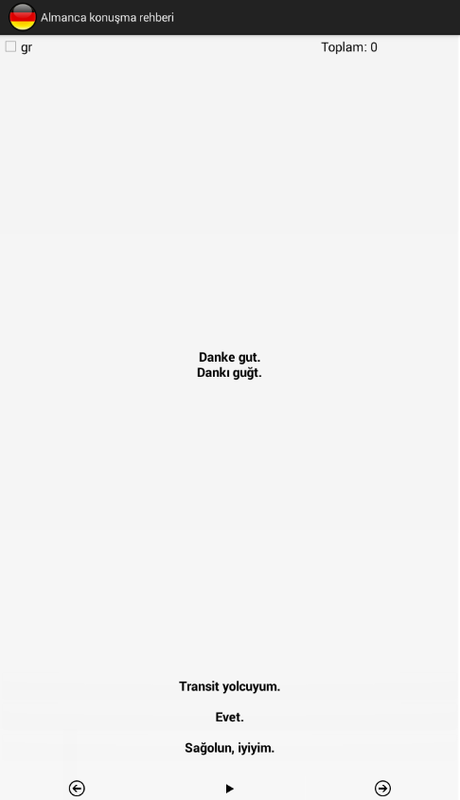 Free Russian-German phrasebook isdesigned for those who are not very good command of the Germanlanguage, it will facilitate communication and mutualunderstanding. Phrasebook works in offline mode and does notrequire internet connection to work.If you are going on a trip toEurope or have planned trip to the German city, our Russian-Germanphrase book is exactly what you need. Phrases, separated bysubject, will help you quickly navigate the situation and help inconversations. Transport, shopping, finance, travel, love,restaurant, hotel - everywhere you will be able to communicate,even with the lowest knowledge of the language. Language German,Austrian, Liechtenstein and most of the Swiss, the official Germanlanguage in Austria, Liechtenstein, one of the official languages​​of Switzerland, Luxembourg and Belgium. He is one of the world'smost widespread language after Chinese, Arabic, Hindi, English,Spanish, Bengali, Portuguese, Russian and Japanese. German - one ofthe official and working languages ​​of the European Union andother international organizations. 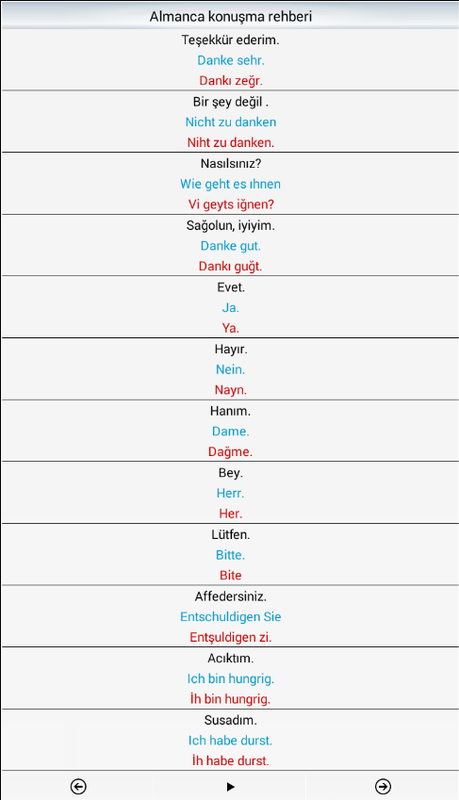 German Phrasebook is an easy andfun new way to learn German. It’s true that anyone can speak another language. "Turkish for all"helps you interact with people who know Turkishlanguage.Recommended app for tourists and business people visitingTurkey. You can easily speak and understand the local people. Ourprogram also has four language quizzes that help you learn languagein a fun way.Speak Turkish with perfect native accent.Tap tolisten, compare and learn, have fun with it!Immensely boost yourconfidence to go out and talk to peopleDo it in an Easy and Fun waythat skyrockets your knowledge of Turkish like you’ve never dreamedbeforeYou will find in this application:the most useful real lifephrases to get YOU ready for conversationsprofessional nativespeakersgreat voice clarityquiz questions to test yourknowledgereally simple and innovative interfaceALWAYS LEARNPHRASES, NOT INDIVIDUAL WORDS:Meaning: Phrases are easier toremember, because they have meaning, they paint a picture, theytell a story.Speed: When you learn phrases instead of a word,you're learning how to use that word correctly, and it’s muchfaster. When we're children, we learn with phrases, groups ofwords, not just one word by one word by one word. Word by word isslow.Pronunciation: In real life some groups of words are said asthough it were a single word, in one breath-group, without pausing.If you stop to take a breath in the middle of the phrase, you arenot saying it correctly, and you risk being misunderstood.LEARNWITH YOUR EARS AND WITH YOUR EYESListen, listen and again listen isthe magic key to speaking excellent TurkishListen to how the nativespeaker speaks some words more strongly with different loudness,speed or pitch. In Turkish, these strong words are about new orimportant information. Without the correct stress on words,listeners may get the wrong meaning.All our materials are writtenand spoken so you can hear, see and learn fastUSE REAL PROFESSIONALMATERIALSThis will help you to be immersed as soon as possible inthe foreign language environment.All the recordings you will listento are made by native professionals.LISTEN TO YOUR OWNVOICESelf-recording is the best approach for reviewing andeliminating diction and pronunciation and grammar errors from yourspeech. It develops Self-Awareness, which in turn lends itself toSelf-Correction.Studies have shown that we focus most on voicesthat are similar to our own, therefore, by listening to your ownvoice the learning process is greatly accelerated.You can recordyour own voice, compare it with the native recordings and exerciseuntil you speak with perfect accentWORK WITH A MODELPronunciationdeteriorates easily, so the longer you go without checking yoursagainst a native, the more likely you are to revert to your motherlanguage speech habits.Check your pronunciation often until goodspeech habits are firmly established in the new language.Use thisapplication to achieve all these and more while having fun withit! "Turkish for all" contains over 500+ commonly-used Turkishphrases and vocabularies for travelers and beginners.Together withyou to practice your speaking and listening skills, wherever andwhenever you are. 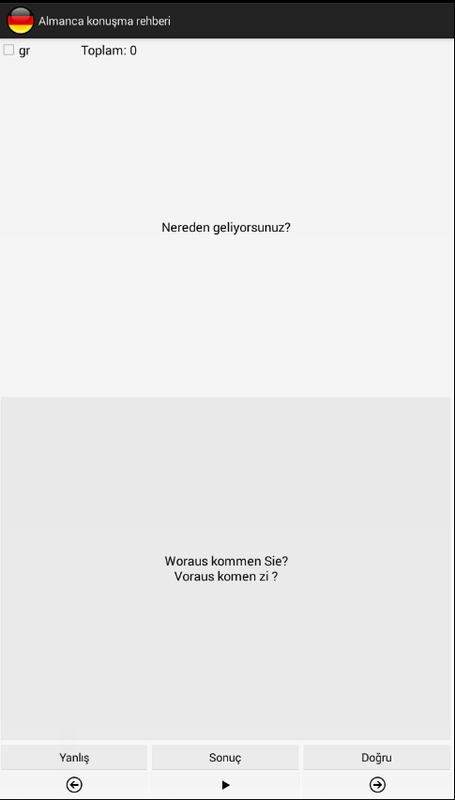 Learning Turkish can never be easier. VoiceTra is a speech translation app that translates your speechinto different languages. VoiceTra supports 31 languages and can bedownloaded and used for free. With an easy-to-use interface, youcan also check if the translation results are correct. VoiceTra,whether to enhance your travel experience or to welcome visitors toJapan, will definitely come in handy as your personal speechtranslator. ■Features: VoiceTra utilizes high-precision speechrecognition, translation, and speech synthesis technologiesdeveloped by the National Institute of Information andCommunications Technology (NICT). It translates your spoken wordsinto different languages and outputs the results in a synthesizedvoice. The translation direction can be instantly switched; 2people that speak different languages can communicate using asingle device. Text input is available for languages that do notsupport speech input. VoiceTra is best suited for travel-relatedconversations and is recommended for situations and places such asbelow: ・Transportation: Bus, train, rent-a-car, taxi, airport,transit ・Shopping: Restaurant, shopping, payment ・Hotel: Check-in,check out, cancellation ・Sightseeing: Overseas travel, serving andsupporting foreign customers *VoiceTra has also been introduced asa disaster-prevention, disaster-related app. While VoiceTra can beused as a dictionary to look up words, it is recommended to inputsentences as it interprets the meaning from the context to outputthe translation results. ■Supported languages: Japanese, English,Mandarin, Korean, Arabic, Italian, Indonesian, Urdu, Dutch, Khmer,Sinhala, Spanish, Thai, Taiwanese Mandarin, Danish, German,Turkish, Nepali, Hungarian, Hindi, Filipino, French, Vietnamese,Polish, Portuguese, Brazilian Portuguese, Malay, Myanmar,Mongolian, Lao, Russian ■Restrictions, etc. : Internet connection isrequired. It may take a while to display the translation resultsdepending on the network connectivity. Languages available for textinput are those that the OS keyboard supports. The characters maynot be displayed properly if the appropriate font is not installedon your device. Please note that some of the functions or theapplication itself may be disabled when the server is down. Usersare responsible for the communication fees incurred to use theapplication. Please be aware that international data roamingcharges can be expensive. The recorded data will be utilized tomake improvements in speech translation technologies. - Learn Arabic by Speaking for travelers and beginners, LearningArabic could never be easier! - Over 1000+ Common Phrase verbs,vocabularies and sentences with native Pronunciation. - Extremelyuseful and Easy to Use. - Many everyday subjects with carefullycategorized. - Recorded and Compare your pronunciation. - Instantsearch for Phrases by English and Arabic. - Bookmark and manageyour favorites. - No Internet connection required, use it anytime,anywhere. - This app is a perfect travel companion when visitingArabic speaking countries and you don’t speak the language – andnobody understands yours. This translator will turn your mobile device into a simultaneousinterpreter, which is always with you. Travel, communicate, holdbusiness negotiations with Speak and Translate. In any country asat home! Voice translator automatically detects and converts speechinto one of 100 foreign languages. Want to go to another country,but do not know whether there will be online? Not a problem - savefavorite phrases in Favorites and pronounces them offline. Learnlanguages, check your pronunciation or use Speak and Translate as adictionary or phrasebook. Traveling around the world with itwithout knowing the language is not a problem anymore! Advantages:► Automatic language detection ► Several modes of operation ►Google and Microsoft translation services use ► Communication in adialogue mode without additional clicks ► The possibility to playany previously translated phrase from Favorites in OFFLINE ► Thepossibility to sort phrases in Favorites by category ► Thepossibility to filter phrases in Favorites by category and languagepairs ► Available widgets for fast access to Favorite’s categoriesand to other program functions ► A visual display of all phrases ofa dialogue ► A visual display of the supported mechanisms (voiceinput, “text to speech”) for each language ► Repeated voiceplayback of any translated phrase ► Unique algorithm of speechactivity detection ► The possibility to translate without pressingthe buttons ► The possibility to set the quality of recording ► Thepossibility to manually set the language for each phrase Important:► Use the voice translator for foreign language learning ► Improveyour vocabulary ► Check your pronunciation Free version limits: 1)Only Microsoft translation server are available. In PRO-version youcan select translation server. The user can select between Googleand Microsoft servers. Google server additionally supports 25languages 2) Limitation for the number of recognized words ONLY if"Language auto-recognition" is selected. Limit for FREE-version is7 words only 3) Limitation for the number of trials of operation in"live dialog" mode. Limit for FREE-version is 5 only. After it youcan restart program to use "live dialog" mode again. Simply Learn Japanese is an ultimate tool for learning Japanesewhen you visit Japan. We have all important Japanese phrases andJapanese words that you are going to need during your visit and wepresent it to you in both phonetic and original Japanese text.Doesn’t know how to correctly speak Japan? We also record thecorrect pronunciation by a native Japanese girl. If you plan tovisit the Sakura country, learning a bit of basic Japanese can helpyou survive your visit and makes it more pleasant. Japaneselanguage can be confusing for people who don’t speak Japan everyday. If you plan to visit Japan, you might be looking for aJapanese translate app or an app to help you learn Japanese,especially basic Japanese language. We have included all importantphrases are included. For example, let the app speak to the Taxidriver in Japan to show them where you want to go. Use our app fora basic Japanese language training to prepare for your travel.Simply Learn Japanese - Learn Japanese – Free Japanese Phrasebook★★★TOP FEATURES★★★ • Save important and your favorite Japanesewords and Japanese phrases so you can review them easily later. •Use our basic vocabulary flashcard for language training &improving your language skills and basic vocabulary. • Test yourlanguage skills with our fun quiz and review your score to see howfar you can speak Japan. • Survive in Japan using our Japanesetranslate app! Search all phrases and words to quickly access whatyou need. We have total of 1200+ Japanese phrases and words. 300phrases are FREE to access and you can unlock the rest with anin-app purchase option. • Let our app speak Japan (for example tothe taxi driver). The speaker from our app is a native girl fromJapan so she can speak & pronounce every Japanese word clearly.• High quality audio with the ability to play and replay the soundslower. • A great system for learning Japanese with spacedrepetition system. • Copy a Japanese phrase to the clipboard forlater use. • You can also adjust the settings for Japanese languagequiz & vocabulary flashcard settings. You can set it forJapanese to English, English to Japanese, Phonetics to English, andEnglish to Phonetics. Simply Learn Japanese has 33 learningcategories 11 Free Learning Categories Use our app for Japaneselanguage training with 300+ free Japanese phrases and Japanesewords in the following categories: Numbers, Time&Date, BasicConversation, Greetings, Directions Phrases, Directions Words,Eating out in Thailand, Sightseeing in Thailand, Shopping inThailand, Emergency, Accommodation 22 Categories in the Pro VersionImprove your language skills by unlocking the Pro Version. Get 900+more Japanese phrases and words in the Pro version with thefollowing additional categories: Advanced Conversation, Health,Border Crossing, Questions, Places, Food, Vegetables, Fruits,Colors, Romance I, Romance II, Post Office, Phone & Internet,Banking, Occupations, Business Talk, Hobbies, Feelings, Body,Animals, Family, Countries We appreciate your feedback!! If youenjoy improving your Japanese words vocabulary and using our app toimprove your language skill, please leave a rating and review. Ifyou have any feedback, suggestions or advise I am more than happyif you let me know at [email protected] We hope you havefun learning Japanese with us! *** Learn Korean language when visiting Korea *** All Koreanphrases and words are presented to you in both phonetic andoriginal Korean writing. They are recorded by a native girl fromKorea. Save your favorite phrases and words to review them withoutfuss. Study your vocabulary with flashcards using the spacedrepetition technique. Test your knowledge with fun Korean languagequiz and review your score. *** Survive when travelling in Korea*** Use the Korean phrasebook to survive in Korea. All importantsurvival phrases are included. For example, let the app speak tothe Taxi driver in Korea to show them where you want to go. Searchall phrases and words to quickly access what you need. *** MainFeatures *** * 300+ free Korean phrases and words * Recorded by anative girl from Korea * High quality audio * Spaced repetitionlearning system * Korean quiz to review your skills * Track yourlearning progress * Save your favorite phrases and words * Quicksearch function * Copy the phrases to the clipboard (by clickinglong on the phrase) * Play the sound more slowly * Adjust the quizand flashcards settings for Korean -> English, English ->Korean, Phonetics -> English, English -> Phonetics *** 11Free Learning Categories *** Learn with 300+ free Korean phrasesand Korean words in the following categories: * Numbers *Time&Date * Basic Conversation * Greetings * Directions Phrases* Directions Words * Eating out in Korea * Sightseeing in Korea *Shopping in Korea * Emergency * Accommodation *** 22 Categories inthe Pro Version*** Learn with all 900+ Korean phrases and words inthe Pro version with the following additional categories: *Advanced Conversation * Health * Border Crossing * Questions *Places * Food * Vegetables * Fruits * Colors * Romance I * RomanceII * Post Office * Phone & Internet * Banking * Occupations *Business Talk * Hobbies * Feelings * Body * Animals * Family *Countries *** Feedback appreciated *** If you like this app, pleasetake a few seconds to give a rating or review. If you have anyfeedback, suggestions or advise I am more than happy if you let meknow at [email protected] Have fun learning Korean! Free offline* speech translator, dictionary and phrasebook app--translate offline voice, camera photos and text between Englishand Spanish without internet and when you are abroad! Save on dataroaming charges when you travel! Our app features unique offlinetranslation technology often delivering translations that excelboth Google Translate and Microsoft Translator while using muchless storage space (approx. 100MB) TRANSLATE TEXT - translate fullsentences and entire texts without internet; - translate instantlyas you type offline; - fully functional offline translator betweenEnglish and Spanish without any internet connection; -automatically detects input language; TRANSLATE VOICE / SPEECH -offline voice/speech input* for English and Spanish; - offlinevoice output for English and Spanish; - allows reading individualwords by tapping the desired word in the translation; TRANSLATEPHOTOS / PICTURES AND OCR - use your device camera instead oftyping; - take a picture of printed text and translate it inseconds offline! - available for English and Spanish; - use thisfeature to easily convert photos of printed text into editable textin offline mode; TRANSLATE WORDS / DICTIONARY - dictionary betweenEnglish and Spanish; - recognizes any word form and identifies itsfeatures (number, person, gender, etc.) - displays all thetranslations for a given word; - displayed for single words; -allows reading individual words by tapping the desired word in thetranslation; HISTORY / PHRASEBOOK - you can create your ownphrasebook by hitting the save button; - all saved translations canbe viewed for reference; FREE VERSION - you can try voice outputand photo translation 100 times; - you will be reminded to supportus by getting one of our paid apps (*) You have to run the apponline once in order to download the data file; (**) Voice/speechinput is available on most devices running Android 4.0+. If youencounter problems with the app, please contact our customersupport! Free offline* speech translator, dictionary and phrasebook -- theultimate foreign language text translation tool for English andFrench when you are abroad! Save on data roaming charges when youtravel!Our unique offline translation technology often deliverstranslations that excel both Google Translate and MicrosoftTranslator while using much less storage space.TRANSLATE TEXT-instant offline translation as you type;- fully functional offlinetranslator between English and French without any internetconnection;- automatically detects input language;TRANSLATE VOICE /SPEECH- offline voice input* for English and French;- offline voiceoutput for English and French;- allows reading individual words bytapping the desired word in the translation; TRANSLATE PHOTOS /PICTURES AND OCR- take a picture of printed text and translate itin seconds offline! - available for English and French; - use thisfeature to easily convert photos of printed text into editable textin offline mode; DICTIONARY- dictionary between English andFrench;- recognizes any word form and identifies its features(number, person, gender, etc. 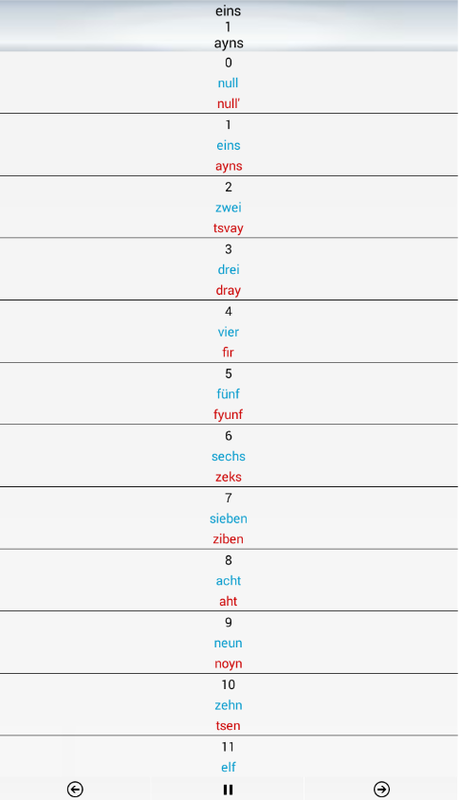 )- displays all the translations for agiven word;- displayed for single words and collocations;- allowsreading individual words by tapping the desired word in thetranslation; HISTORY / PHRASEBOOK - you can create your ownphrasebook by hitting the save button;- all saved translations canbe viewed for reference; (*) You have to run the app online once inorder to download the data file;(**) Voice input is available onmost devices running Android 4.0+.If you encounter problems withthe app, please contact our customer support! PLEASE BE INFORMED THAT ALL OUR LANGUAGE SUPPORT AND SERVICES AREIN KOREAN. With 'NAVER Global Phrase Book', you don't need to worryabout languages while traveling abroad! It is a multilingualphrasebook application featuring essential phrases in 15 differentlanguages. Now you can travel with confidence. (SupportedLanguages: English, Japanese, Chinese, French, Spanish, German,Vietnamese, Russian, Italian, Thai, Indonesian, Mongolian) ■ Goingoverseas? Take 'NAVER Global Phrase Book' instead of thick andheavy phrasebooks. Check out the 2,000 practical and useful phrasesin 15 different languages that you will definitely need during yourtrip overseas. It is easy to find the sentence you need, as thephrases are neatly organized by situations and you can search inKorean as well. ■ Read, listen, and speak. In addition to theoriginal language, all phrases are spelled in Korean, helping youeasily pronounce sentences even if you don't know the language. Youcan hear the pronunciation of native speakers by tapping thespeaker icon. Make sure you get the right intonation and accent! ■Learn keywords first. If a sentence is too long and difficult torepeat after, just say a keyword to get your point across. When youtap the keywords represented in blue letters, the speaker icon willappear along with the pronunciation in Korean. ■ Still toodifficult? Just show your screen! It is a frustrating experiencewhen people can't understand what you are trying to say, and evenworse when you're in a hurry. In that case, just show them yourscreen in full screen mode. The application supports a full screenmode that enlarges letters, making it easier to show people. Pleaseleave your inquiry with NAVER Customer Center (http://me2.do/xbhmfgCo ) in case a problem occurs while using app.The NAVER customer center is more than happy to help.